PROPERTY fortunes move in cycles, a fact that real estate investor Zain Fancy knows all too well. The 40-year-old former high- flying investment banker has already been through more professional ups and downs than most people experience in a lifetime. After a stellar 10-year career in real estate investment banking at Morgan Stanley, Mr Fancy left to spearhead an ill-fated property investment joint venture that ended in an acrimonious legal wrangle. Now, the Pakistan-born father of one is finding success again in his latest endeavour: a Singapore-based firm investing in properties across Asia worth between $10 million and $100 million each. Clifton Real Estate Group prides itself on being very "picky" about its property choices, since it focuses on unlocking value over the long term, Mr Fancy told The Straits Times in a recent interview. The company has amassed a portfolio worth about $250 million so far, many of which are Singapore shophouses. "We look for assets that are well-located but have been neglected or require an upgrade or renovation in order to fulfil their true potential," said Mr Fancy, who became a Singapore citizen in 2009 and lives here with his wife and daughter. 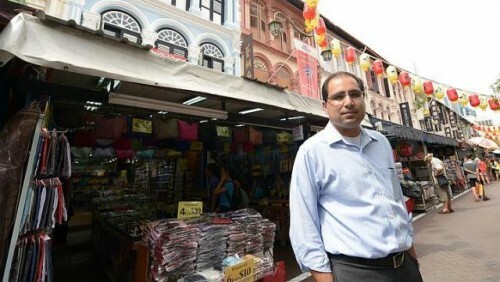 "We evaluated over 150 potential shophouses for over a year before we made our first investment." After investing in a property, Clifton renovates the asset with a singularly meticulous approach that Mr Fancy described as its competitive edge. Its "extremely hands-on" methods include carefully selecting each piece of material for the renovation process. "Our goal is to create the nicest looking property on the street," he said. "We would like to be known for our attention to detail and our quality finishes." The renovated properties are usually rented out to new, higher-paying tenants. Clifton is now renovating four shophouses it owns in colourful Pagoda Street in the heart of Chinatown, and expects to double their rental income once works are completed. "We really believe in the Chinatown area - lots of good foot traffic, near the MRT," he said. But sometimes, the company gets an offer too good to refuse. Last year, Clifton bought a 6,910 sq ft shophouse at 72 Peck Seah Street for $12.2 million and resold it for $16.8 million - all within the space of a few months. "Most pan-Asian investors complain that Singapore does not offer attractive investment opportunities currently and there is too much capital 'chasing' opportunities," Mr Fancy said. "While this may be true broadly, in our space we have still been able to find compelling opportunities." In fact, Clifton, which now has 12 employees, initially planned to invest across Asia but has yet to venture beyond Singapore due to the "extremely interesting investment opportunities here". The Government's property cooling measures, which have dampened some of the red-hot demand for real estate here recently, have presented buying chances, Mr Fancy said. "We believe in the long-term fundamentals of the Singapore property market." He sees particular potential in shophouses, which are limited in supply and have historical charm but are often not well-managed. The prices of such properties have stayed resilient through economic crises, but their rents remain much lower than that of premium office and shop spaces, resulting in strong leasing demand and significant room for shophouse rents to catch up, he said. Clifton is also looking into other types of investments here and abroad. "I expect we will start setting up overseas operations in the next 12 to 24 months," he said. That would be coming full circle for the former head of Morgan Stanley's real estate investment unit in Asia. Mr Fancy was appointed to the post in 2005, following a string of successful property deals he had led in the region. He was just 31 then and had been at the bank for a decade, working in New York and in Hong Kong. In 2006, Morgan Stanley made him a managing director. But in 2008, having built a 120-strong real estate team for the bank, Mr Fancy left to form Och-Ziff Asia Real Estate, a joint venture with New York-based fund manager Och-Ziff Capital Management Group. The timing wasn't great: his stint at Och-Ziff coincided with the onset of the global financial crisis and ended with a lawsuit. In October 2010, he departed the venture and sued two of the fund manager's Singapore-based units for millions that he said he was owed. Och-Ziff's position was that he had acted in bad faith by not disclosing his involvement in a probe being conducted by United States authorities into one of Mr Fancy's subordinates, Mr Garth Peterson, at Morgan Stanley. Mr Fancy told The Straits Times he could not comment on the legal proceedings, which were reportedly settled out of court. Subsequent reports cleared Mr Fancy of any blame for Mr Peterson's corrupt actions. By then, Mr Fancy had moved on. In 2011, he started Clifton Real Estate, named after the affluent suburb in Karachi, Pakistan, where he was born. "Having worked in an institutional environment for over 15 years, and having always had an entrepreneurial interest, I felt I was ready to venture out on my own," he recalled. "In a larger managerial role at Morgan Stanley I was starting to spend most of my time in admin and management and much less in actually being hands-on with managing property or with evaluating and negotiating investments." Given his keen personal interest in properties, it is no surprise that Mr Fancy's own investments have mostly turned out well. His best personal investment was a condo in Hong Kong's Amoy Gardens right after Sars had stopped spreading in the territory. Amoy Gardens had been one of the housing estates most severely affected by the outbreak and was therefore seen as "tainted". "Some owners were panic selling, which made pricing attractive at the time," he said. As for his worst investment, it would be a property in Pakistan, whose value suffered from the country's currency depreciation. "Luckily I waited for the market to recover and was able to get the full amount of my capital investment back," he said. "That is the beauty of property - if you are able to purchase assets with good layouts in attractive locations, over the long run, the value should appreciate." A lesson, surely, that applies to people with strong fundamentals too.